FREE SHIPPING IN 48 STATES - locations with normal delivery access in the continental U.S. 48 states; locations in Alaska, Hawaii, and outside the U.S. require additional shipping cost, e-mail us for a shipping quote if needed. For Truck shipments, you must be able to unload the items at the delivery point (lift gate service is extra, please order if needed). Delivery pickup at the terminal can also be requested, for delivery options, see the drop down menu on this page. 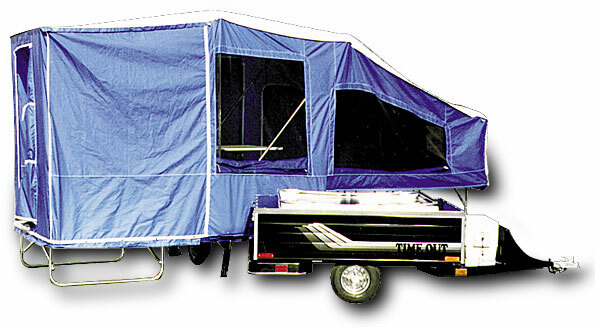 Model Timeout motorcycle towable pop-up style camping trailer. 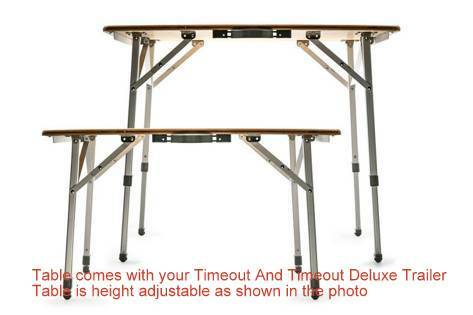 The Timeout model camping trailer is specifically designed to be towed by motorcycles (750cc) and larger. 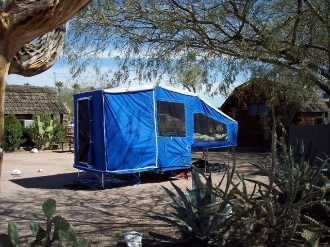 The Timeout is a pop-up style camper that is compact when towing, but opens up to sleep 2 people comfortably on a queen size bed and includes a living area with table, and a dressing area you can stand up in. All areas are off the ground so your tent never gets muddy. The Timeout can be set up in approximately 3 minutes and gives you one of the largest motorcycle towable campers available. Trailer weight is 345 lbs. The trailer comes completely wired, and includes the plug with 5 wire pig tail for the bike wiring. In most cases you can simply splice this pigtail into the wiring on your bike (especially on older bikes and bikes without lots of extra running lights). If you do not want to directly splice into the wires, then we have several wiring kits available to allow you to directly plug into the factory harness without splicing. Many of these kits will be available with or without an additional connector for a wiring isolator kit. If you have auxilliary running lights on the bike you will want the isolator kit. See the drop down menu on this page for the kits available, and the isolator kit.